Distribution facility located in the south Tijuana town of Rosarito. 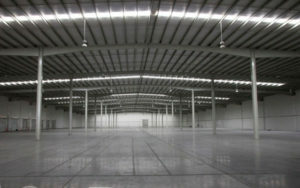 This 50,000 SF space within a 100,000 Sf building is suitable for warehousing, light manufacturing or assembly. Includes expansion space as well as 5 dock doors, 1000 sf office space and 150 KVA. Cool ocean breezes mean lower HVAC costs. Fifteen miles from the Otay Mesa border crossing and two miles from the center of Rosario Beach. Bonus ocean views. Distribution facility available for lease in south Tijuana. Located in the coastal town of Rosarito, this 50,000 SF space inside a 100,000 SF building is also useful for light manufacturing, warehousing or assembly.